← Monday 28th July 2014 – Oh I do like to be beside the seaside…. Not that we need any help with that in our house!! But I popped up the allotment this morning to do some harvesting and to generally see how everything was behaving itself. Very well from what I saw. I harvested a load of French beans, which I have now taken the tops off and they are now in the freezer until we need them for dinner. I managed to harvest 2lb 12oz of Dwarf Purple French beans and 3lb 10oz of Climbing Green French beans. So I think that’s enough to keep us going for quite a while. There are still lots more to come. It doesn’t matter if your french beans go too far, they don’t get stringy like Runner beans do. I then dug up some Potatoes, mainly rogue ones that I forgot last year. I got some rather sizeable ones, so that’s potatoes for dinner sorted out for the next few days. Then finally I had a look round my plots to see how all the other veg were getting on. The Pumpkins are growing very well. I have loads growing, all of varying sizes. 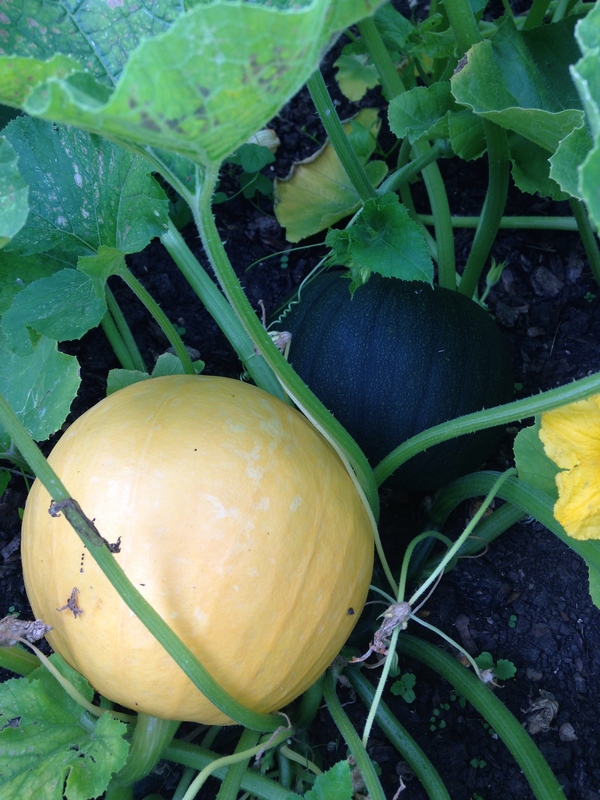 Pumpkins are growing well, here are a couple to show you. I do have an even bigger one, but I’m keeping that a secret. Also my Butternut Squash are growing well. I have loads of flowers and I found 3 little ones growing. Hopefully I’ll get loads this year as they keep for ages in a frost free place over the winter. We do like to roast them with chicken. 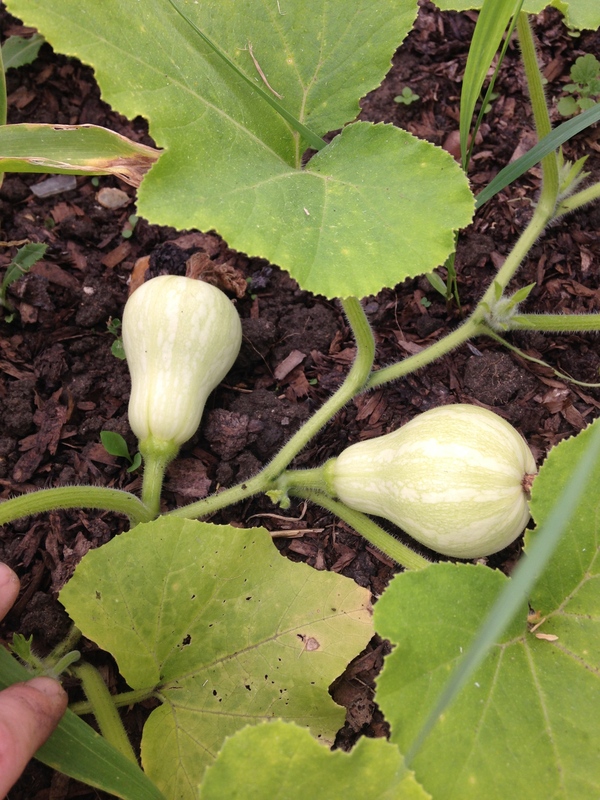 Two baby butternut squash growing. Keep growing my beauties. But everything else is doing well, so I’m a very happy little lass. I also harvest some more Cucamelons from the greenhouse, they’re prolific growers, and I’ve got loads of Tomatoes growing to. So all in all it’s progressing very nicely. Long may it last. This entry was posted in Uncategorized and tagged butternut squash, claire's allotment, climbing french beans, cucamelons, dwarf french beans, potaotes, pumpkins, runner beans, tomatoes. Bookmark the permalink. 8 Responses to Friday 1st August 2014 – Beans, beans are good for your heart, the more you eat the more you…. Do you do anything else with the French beans when you freeze them? I just take the tops bit off, wash and then freeze. Then when I want to cook them I boil the water and put the frozen beans in the water for about 3 minutes. I don’t bother to blanch them before I freeze them, as I find that it makes no difference. Thanks that’s what I will do as we have some many French beans and runner beans at the moment and not enough time to eat them! Long may it last indeed! I’m so glad you enjoyed you Cucamelon. I think my mum is growing them for the first time this year to. Make sure they don’t get too big as they get bitter. I love butternut squash because it’s all meat all the way to a very thin shell. Tasty too, but this year, the seed did not germinate very well. I’m going to miss it. I had various sizes of Butternut Squash this year. So on Sunday I took 4 small ones and roasted them in their skins in the oven for about an hour. They were gorgeous. I hope you’re able to grow some next year.